My wife and I spent some time with her dad and step-mom over the weekend, and I was giving the in-laws an update on the book I'm writing about Dr. J. Allen Hynek. My father-in-law has always taken an interest in my writing, so there was nothing unusual about the conversation -- until my step-mother-in-law looked at me and said, "You know, he's had a UFO experience." My father-in-law grew quiet and blushed a little, but he didn't deny it. I was shocked. I've known the man a few years and I've never heard anything about this. My wife has known him even longer than I have, and it came as a complete surprise to her, too. We started prodding him for information, and he deftly changed the subject about, oh, 35 times over the next ten minutes. The man really didn't want to talk about it, and he's a guy with the gift of gab... It was truly impressive how completely he clammed up over this. But eventually he opened up. 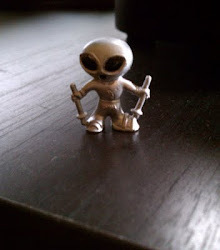 I told him about some of the recent UFO cases I've investigated for MUFON, tried to put him at ease, let him know that very strange things happen to an awful lot of people. Then I told him about how Dr. Hynek used to say "Ridicule is not a part of the scientific method, and people should not be told that it is," and finally he told us his story. It happened in 1962, when he was 17, but he still remembers it vividly. He was driving home late at night on a country highway in Ohio, and his car ran out of gas. Did I mention he was 17? 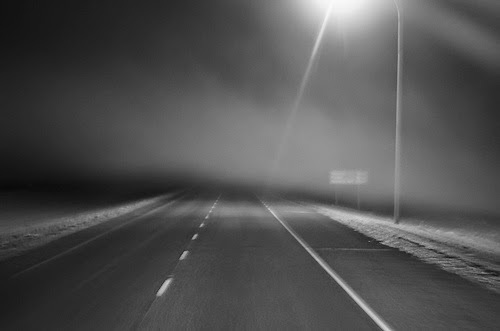 He knew he had a walk ahead of him, so he left the car along the highway and set out for the next town. Although he was in the country, there was a certain degree of ambient light, both from the stars and from the occasional farm or billboard. So it was pretty disorienting when all the lights went out. He corrected himself then: the lights didn't actually "go out" in the normal sense; they just ceased to be. He was just in the dark, literally and figuratively. He walked on for a ways, until he realized he was on some sort of vast moving surface... He equated it with the surface of a body of water that stretched out without limit in all directions. And he got a message from them. In his head, he heard the message that everything was going to be okay. Then the platform moved again and in time he found himself walking along the highway again... the light came back on, and everything was as it was when they had gone out. Because he didn't know when the experience began, he had no idea how much time had elapsed, or whether there was any "missing time" involved. Some time later the police found him walking along the highway and gave him a lift. After he finished his story, my father-in-law was visibly relieved, both to have told the story and to have been believed. My wife and I both felt privileged that he shared something so personal with us. I'm still not sure what to make of it. On some points his memory was crystal clear, but on others -- the description of the entities, for instance -- details were lacking. In some ways the memories blend in with the walk along the highway, in other ways they seem to exist in a reality all of their own. I know one thing: my father-in-law is not subject to flights of fancy. The man's faced some big challenges in his life, and he has never run from them. He's the last person on earth I would have expected to tell this kind of story. My interest in UFOs sprang from an encounter my cousin, her husband, and four kids had along with neighbors and sheriff's deputies who were called to the scene. 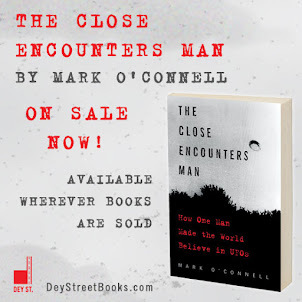 I don't want to be a secondhand source and just add more garbled information to the game of broken telephone that plagues Ufology, but I will share that in the 1980s they experienced a series of close encounters near their home over the course of a week that would defy any attempt at a rational explanation (it would leave the Greek chorus of professional skeptics just shaking their heads and damning them as liars). But having heard their story firsthand at the time and seen their lingering terror makes it too damn difficult to dismiss or try to explain away. Yeah, when it happens close to home, so to speak, it gets real. Absolutely, it changes everything when you know the witness really, really well. When you recognize the person's verbal and non-verbal cues, you're getting multiple levels of perception and understanding that make the story far more interesting, and I'd say far more credible as well.